For decades, Nintendo’s Legend of Zelda series has stayed more or less faithful to its original character design for its hero, Link. In each game, the silent protagonist has long bangs, pointed ears, and green clothing. 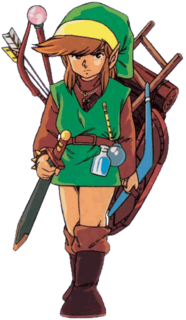 In his very first adventure, though, Link didn’t wear any pants. Instead, he sported a thigh-length tunic-like garment. It was a bit of an odd choice, considering that his bare legs sticking out kind of made it look like a dress. But hey, maybe the fabric used for Hyrulian underwear doesn’t breathe well, and Link needed all the cooling ventilation he could get while running through those eight dungeons. Or perhaps the reason he went pantless is because that was neither a tunic nor a dress, but a comfortable Legend of Zelda bathrobe, like this one you can now buy for yourself. Japan really isn’t so into bathrobes, so it’s a little unusual to see one of the country’s video games used as the motif for one. The Legend of Zelda is a worldwide hit, though, and you can thank U.K.-based Merchoid for this snazzy number sewn in the same earth tones that are always featured in Link’s starting gear. While being worn and looked at from the front, the robe looks like any other piece of post-shower clothing. The back, though, is resplendent with the crest of Hyrule, which can also be found on the robe’s lining. The Zelda fanbase includes plenty of creative individuals who create art and crafts inspired by the series for their own enjoyment, but Merchoid’s robe is officially licensed by Nintendo, meaning the company is free to produce and sell as many as they like. Preorders are currently being taken here for the US$79.99-robe, which is available in medium (recommended for customers five feet, eight inches [173 centimeters] and shorter) and large sizes. Shipment is scheduled for August, and amazingly, Merchoid offers free shipping not just in England, but anywhere in the world. We’re not sure how they’re able to offer such an attractive deal, but we’re guessing the reason is either good old fashioned generosity or a team of deliverymen equipped with magical recorders that let them instantly teleport to your house and drop off your robe without ever having to pay for gas.